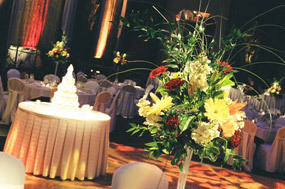 Accent the celebration of your special Day! From the parties and family gatherings before the wedding to the reception, let's add a special welcome to your guests with the sight and scent of flowers. From sprinkling rose petals around lit candles to elegant floral arrangements on the tables, you can add ambiance and excitement to the celebration. Adding fresh flowers to your cake speaks of romance. Why don't you have your guests shower you, the bride and groom, with natural confetti of rose petals? Drape the bridal party table with a garland of fresh greenery. 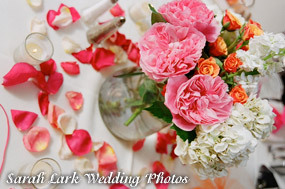 Place vases on the edge of the bridal table to display your bouquets during the reception. Greet your guests with a wreath of flowers on the door. Cleverly decorate the gift-giver box with blossoms and ribbon. Let's create an atmosphere of jubilation that will make your wedding day spectacular. Fill out the form below or call 513-683-9218 to request your free consultation. © Copyright 2019 Terri Muennich. All rights reserved. Site Design by Animorphic Studios, LLC.